PowerPoint presentations tend to be highly visual, and people who are blind or have low vision can understand them more easily if you create your slides with accessibility in mind. The following table includes key best practices for creating PowerPoint presentations that are accessible to people with disabilities. 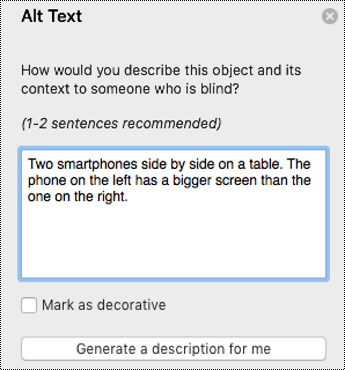 Alternative text helps people who can’t see the screen to understand what’s important in images and other visuals. Avoid using text in images as the sole method of conveying important information. If you must use an image with text in it, repeat that text in the presentation. In the alternative text, briefly describe the image and mention the existence of the text and its intent. 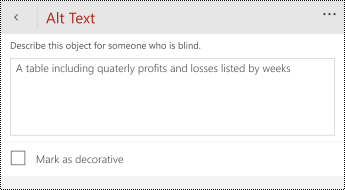 Use the Accessibility Checker to find slides that have possible problems with reading order. When someone who can see reads a slide, they usually read things, such as text or a picture, in the order the elements appear on the slide. In contrast, a screen reader reads the elements of a slide in the order they were added to the slide, which might be very different from the order in which things appear. To make sure everyone reads the contents in the order you intend, it's important to check the reading order. When creating a new slide, use the built-in slide designs. 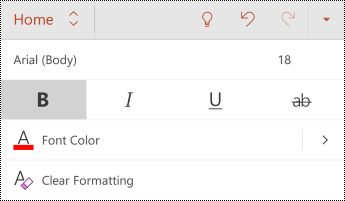 PowerPoint contains built-in slide layouts that you can apply to any slide. When you use them with a new slide, these layouts automatically make sure that the reading order works for everyone. To determine whether hyperlink text makes sense as standalone information and whether it gives readers accurate information about the destination target, visually scan the slides in your presentation. People who use screen readers sometimes scan a list of links. Links should convey clear and accurate information about the destination. For example, instead of linking to the text Click here, include the full title of the destination page. You can even use the URL of the page if it's short and descriptive, for example, www.microsoft.com. Switch to the View tab and select Grayscale. Visually scan each slide in your presentation for instances of color-coding. For example, add an underline to color-coded hyperlink text so that people who are colorblind know that the text is linked even if they can’t see the color. For headings, consider adding bold or using a larger font. 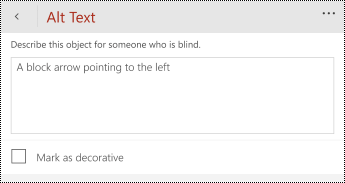 Use strong contrast between text and background, so people with low vision can see and use the content. Use dark text on a white or off-white background, or reverse it and use white text on a dark background. White and black schemes also make it easier for people who are colorblind to distinguish text and shapes. To find slides that do not have titles, use the Accessibility Checker. People who are blind, have low vision, or a reading disability rely on slide titles to navigate. For example, by skimming or using a screen reader, they can quickly scan through a list of slide titles and go right to the slide they want. Screen readers keep track of their location in a table by counting table cells. If a table is nested within another table or if a cell is merged or split, the screen reader loses count and can’t provide helpful information about the table after that point. To find potential issues related to fonts or white space, review your slides for areas that look crowded or illegible. For people who have dyslexia or have low vision, reduce the reading load. For example, they may benefit from familiar sans serif fonts, such as Arial or Calibri. Avoid using all capital letters and excessive italics or underlines. Include ample white space between sentences and paragraphs. Make videos accessible to visually impaired and hearing-impaired users. Subtitles typically contain a transcription (or translation) of the dialogue. Closed captions typically also describe audio cues such as music or sound effects that occur off-screen. Video description means audio-narrated descriptions of a video's key visual elements. These descriptions are inserted into natural pauses in the program's dialogue. Video description makes video more accessible to individuals who are blind or visually impaired. 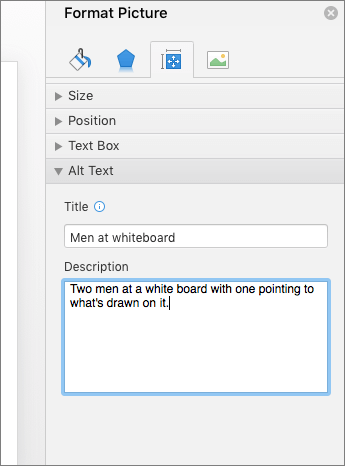 PowerPoint does not automatically generate alt texts for drawn images, such as diagrams or icons. If you want to add an image that is an icon, screenshot, or other image that is not a photograph, you need to add the alt texts manually. Select an image. Select Format > Alt Text. The Alt Text pane opens on the right side of the slide. Tip: You can also select Generate a description for me to have Microsoft's cloud-powered intelligent services create a description for you. This takes a moment, after which you see the result in the text entry field. 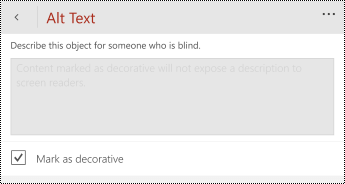 Remember to delete any comments PowerPoint added there, for example, "Description generated with high confidence." Select a shape or a SmartArt graphic. Select Format > Alt Text. Select a chart. Select Format > Alt Text. 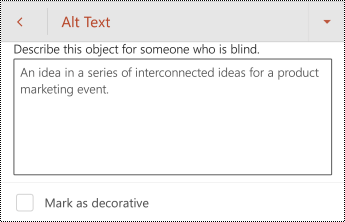 PowerPoint for PC in Office 365 automatically generates alt texts for photos by using intelligent services in the cloud. You can review and edit the autogenerated alt texts. Right-click an image, and then select Edit Alt Text. To change the suggested alt text, type your preferred text in the box. 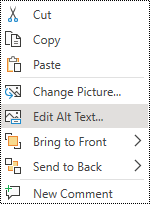 Once you're done, close the Alt Text pane and return to the PowerPoint slide. Select the Decorative check box. 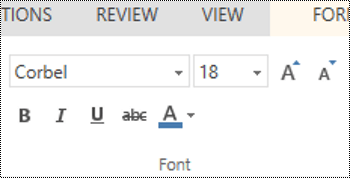 The text entry field becomes grayed out. Right-click an shape or SmartArt graphic and select Edit Alt Text. Select an image, Select Format > Alt Text. Note: We recommend only putting text in the description field and leaving the title blank. This will provide the best experience with most major screen readers including Narrator. For audio and video content, in addition to the alt text, include closed captioning for people who are deaf or have limited hearing. 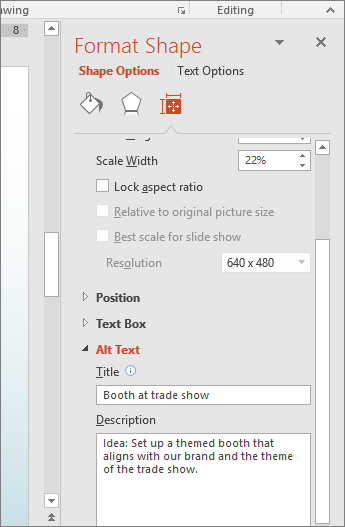 PowerPoint does not automatically generate alt texts for drawn images, such as diagrams or icons. If you want to add an image that is an icon or other image that is not a photograph, you need to add the alt texts manually. Right-click an image and select Size and Position. In the Format Picture pane, select Alt Text. In the text box, type the alt text for the image. Right-click a SmartArt graphic and select Size and Position. In the Format Shape pane, select Alt Text and type a description for the graphic. Right-click a shape and select Size and Position. In the Format Shape pane, select Alt Text and type a description for the shape. Right-click a chart and select Format Chart Area. In the Format Chart Area pane, select Size & Properties. Select Alt Text and type a description for the chart. 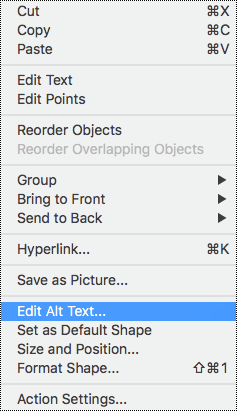 The following procedures describe how to make the hyperlinks, text, and tables in your PowerPoint presentations accessible. In the Address box, enter the description address for the hyperlink. To apply the changes, select OK > OK.
Use one of the included accessible templates to make sure that your slide design, colors, contrast, and fonts are accessible for all audiences. They are also designed so that screen readers can more easily read the slide content. 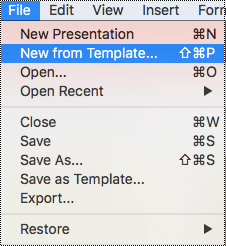 To find an accessible template, select File > New. 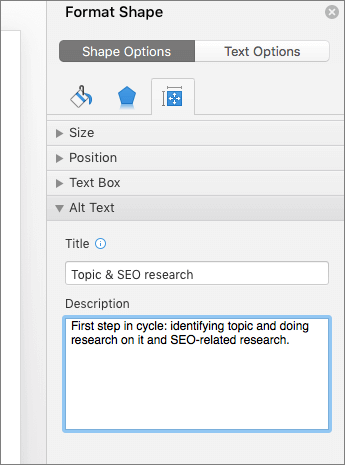 In the Search for Online templates and themes text field, type accessible templates and press Enter. In the search results, select a suitable template. In the template preview window, select Create. 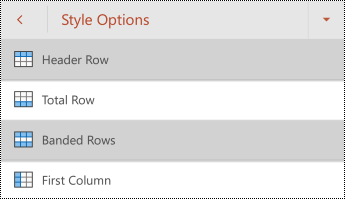 In the Table Style Options, select the Header Row check box. In the table, type the column headings. In the Font group, which provides options for font type, size, style, and color, select your formatting choices. 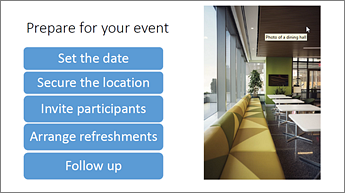 Use the pre-designed Office Themes to make sure that your slide design is accessible. For instructions, see Use an accessible slide design. The following procedures describe how to make the slides in your PowerPoint presentations accessible. To restore all placeholders for the selected slide, on the Home tab, in the Slides group, select Reset. On the slide, type a unique and descriptive title. Make a title invisible on the slide, but still voiced by screen readers. On the Home tab, in the Drawing group, select Arrange. 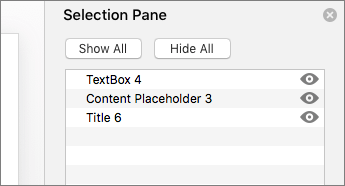 In the Arrange menu, select Selection Pane. 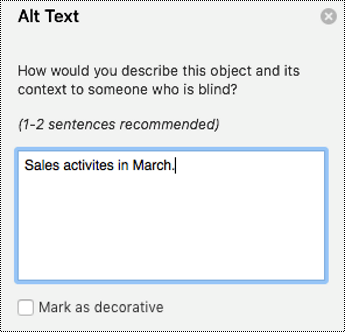 In the Selection pane, locate the Title text box, and then click the eye icon next to it. Use the Selection pane to set the order in which the screen readers read the slide contents. 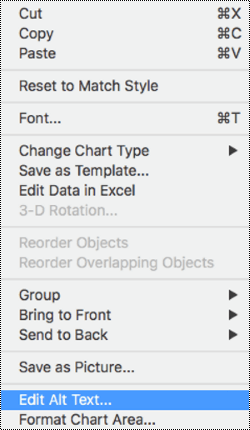 The Selection pane lists the objects on the slide in reverse order. When the screen reader reads this slide, it reads the objects in the reverse order listed in the Selection pane. Drag and drop items to the new location. Select the item and then select the Up arrow button (Bring Forward) or Down arrow button (Send Backward). 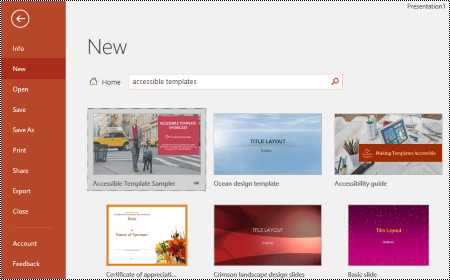 PowerPoint has built-in slide designs that contain placeholders for text, videos, pictures, and more. They also contain all the formatting, such as theme colors, fonts, and effects. To make sure that your slides are accessible, the built-in layouts are designed so that the reading order is the same for people who see and people who use technology such as screen readers. In the Thumbnail pane, locate the place where you want to add the new slide. Right-click, and select New Slide. Click the new slide to select it. 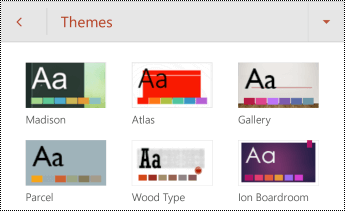 On the Design tab, expand the Themes gallery, and select the slide layout that you want. 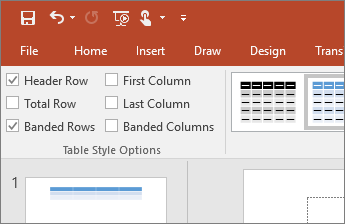 PowerPoint automatically applies this layout to the new slide. Go to the new slide, and add the title and content that you want. PowerPoint supports the playback of video with multiple audio tracks. It also supports closed captions and subtitles that are embedded in video files. Currently, only PowerPoint for Windows supports insertion and playback of closed captions or subtitles that are stored in files separate from the video. For all other editions of PowerPoint (such as PowerPoint for macOS or the mobile editions), closed captions or subtitles must be encoded into the video before they are inserted into PowerPoint. Supported video formats for captions and subtitles vary depending on the operating system that you're using. Each operating system has settings to adjust how the closed captions or subtitles are displayed. Closed captions, subtitles, and alternate audio tracks are not preserved when you use the Compress Media or Optimize Media Compatibility features. Also, when turning your presentation into a video, closed captions, subtitles, or alternate audio tracks in the embedded videos are not included in the video that is saved. When you use the Save Media as command on a selected video, closed captions, subtitles, and multiple audio tracks embedded in the video are preserved in the video file that is saved. Videos include an audio track with video descriptions, if needed, for users that are blind or visually impaired. Videos that include dialogue also include closed captions, in-band closed captions, open captions, or subtitles in a supported format for users that are deaf or hard of hearing. To find instances of color-coding, visually scan the slides in your presentation. Give every slide a unique title. PowerPoint does not automatically generate alt texts for images. If you want to add an image that is an icon, screenshot, or other image that is not a photograph, you need to add the alt texts manually. Tip: You have to right-click somewhere inside the frame that surrounds the entire shape, not inside one of its parts. Tip: You have to right-click somewhere inside the frame that surrounds the entire SmartArt graphic, not inside one of its parts. Select Edit Alt Text.... The Alt Text pane opens on the right side of the slide. If your presentation has visuals that are purely decorative, you can mark them as such without needing to write any alt text. When a screen reader finds such an image, it simply announces they are decorative, so the user knows they are not missing any information. Select a visual. Select the visual's Format tab > Alt Text. To make your presentations accessible to wider audiences, add alt texts to the images in your slides. 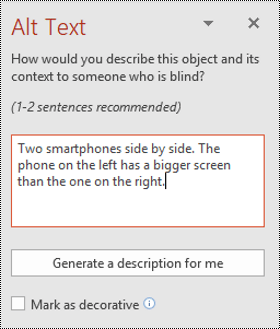 PowerPoint does not automatically generate alt texts. In the Format Picture pane, select Size & Properties. Select Alt Text and then type a description for the image. Select Format SmartArt, and then select Shape Options. In the Format Shape pane, select Size & Properties. Select Alt Text and then type a description for the SmartArt graphic. 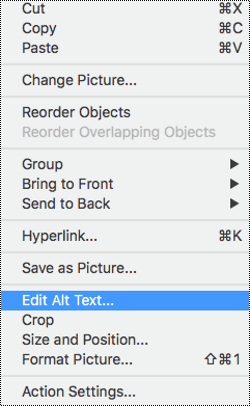 Use the following procedure to add alt text to shapes, including shapes within a SmartArt graphic. Select Alt Text and then type a description for the shape. In the Format Chart Area pane, on the Chart Options tab, select Size & Properties. 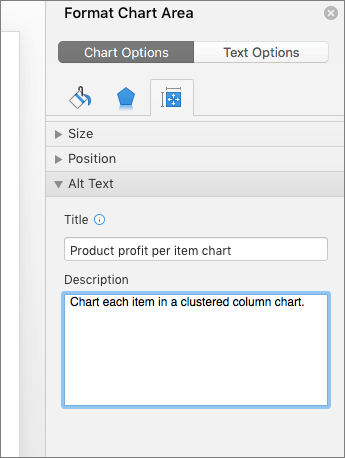 Select Alt Text and then type a description for the chart. Select Hyperlink. The text you selected displays in the Text to Display box. This is the hyperlink text. 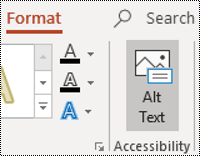 To find an accessible template, select File > New from Template. 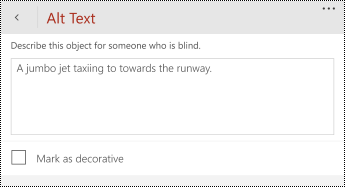 In the Search all templates text field, type accessible templates and press Return. 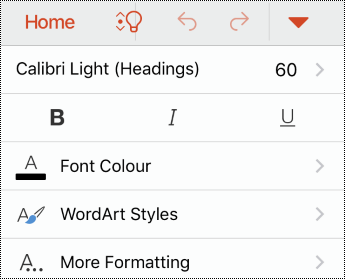 Use the options for font type, size, style, and color to format your text. Position the cursor anywhere in your slide. Type the text you want for each bullet item in the list. Type the text you want for each numbered item in the list. To restore all placeholders for the selected slide, on the Home tab, select Reset. On the Home tab, select Arrange. In the Selection Pane, to change the reading order, drag and drop items to the new location. In the thumbnail pane, locate the place where you want to add the new slide, and then right-click. Select New Slide and then select the inserted slide. Closed captions or subtitles must be encoded into the video before it is inserted into PowerPoint. PowerPoint does not support closed captions or subtitles that are stored in a separate file from the video file. Visual content includes pictures, shapes, charts, embedded objects, ink, and videos. Avoid using text in images as the sole method of conveying important information. If you must use an image with text in it, repeat that text in the presentation. In the alt text, briefly describe the image and mention the existence of the text and its intent. The text in your presentations should be readable in High Contrast mode so that everyone, including people with visual disabilities, can see it well. For example, use bright colors or high-contrast color schemes on opposite ends of the color spectrum. White and black schemes make it easier for people who are colorblind to distinguish text and shapes. 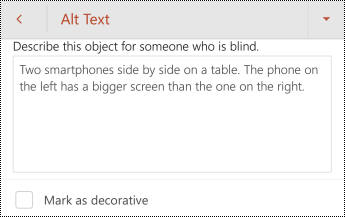 Add alt text to images, tables, shapes and other visual elements, so that screen readers can read the text to describe the element to users who can’t see it. Select the element, for example, an image. To open the related tab, for example, the Picture tab, tap the Show Ribbon button . Tap Alt Text and type a description for the element. For example, describe the content of the image. Use one of the included slide Themes to make sure that your slide design is accessible. 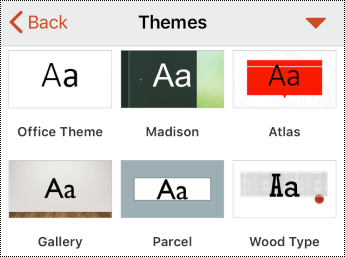 Most of the themes are designed for accessible colors, contrast, and fonts. They are also designed so that screen readers can more easily read the slide content. To open the Home tab, tap the Show Ribbon button . Tap Themes and then select the theme you want. To open the Table tab, tap the Show Ribbon button . Tap Style Options and then select Header Row. 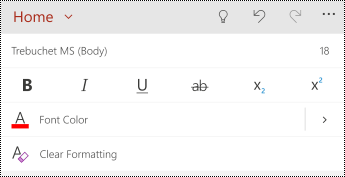 On the Home tab, select your text formatting options. Include alternative text with all images, shapes, and tables. 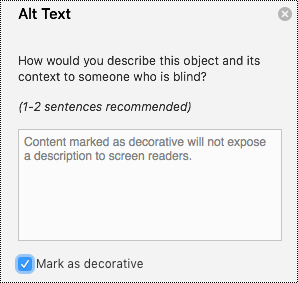 Alt text helps people who can’t see the screen to understand what’s important in images and shapes. Avoid using text in images as the sole method of conveying important information. If you must use an image with text in it, repeat that text in the presentation. In alt text, briefly describe the image and mention the existence of the text and its intent. 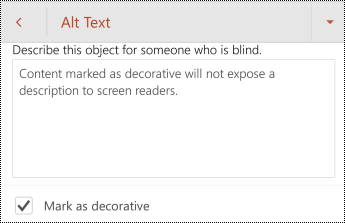 The following procedures describe how to add alt text to visuals and tables in your PowerPoint presentations. To open the Picture tab, tap the Show Commands button . Scroll down to Alt Text, and then tap it. Type a description for the image. To open the Shape tab, tap the Show Commands button . Type a description for the shape. To open the Table tab, tap the Show Commands button . Type a description for the table. To open the Alt Text pane, select an image. To open the formatting menu for the visual, tap the Show Commands button . Tap the Decorative check box. The text entry field becomes grayed out. To open the Home tab, tap the Show Commands button . Tap Themes, and then select the theme you want. 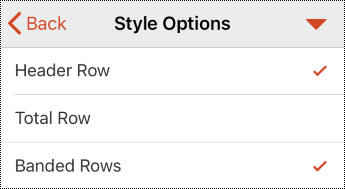 Tap Style Options, and then select Header Row. Tip: When the option is already selected, it’s grayed out. Supported video formats for captions and subtitles vary depending on the operating system that you're using. Each operating system has settings you can use to adjust how the closed captions or subtitles are displayed. To open the Picture tab, tap the More options button. To open the Shape tab, tap the More options button. To open the Table tab, tap the More options button. 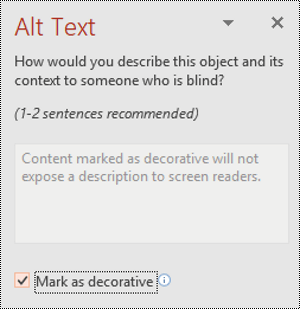 To open the Alt Text pane, select a visual. To open the Home tab, tap the More Options button. The following table includes key best practices for creating PowerPoint Online presentations that are accessible to people with disabilities. Visual content includes pictures, SmartArt graphics, shapes, groups, embedded objects, and videos. Circle or use animation to highlight information, rather than relying on laser pointers or color. To find insufficient color contrast, look for slide text that’s hard to read or to distinguish from the background. The text in your presentations should be readable so that everyone, including people with visual disabilities, can see it well. Avoid using orange, red, and green in your template and text. Use patterns in graphs, instead of color, to highlight points of interest. Use the Accessibility Checker to find slides that don't have titles. 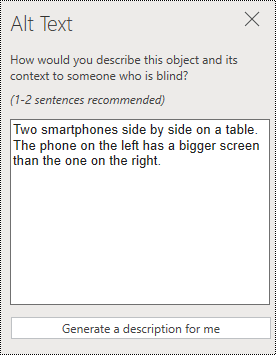 People who use screen readers and other assistive technology hear slide text, shapes, and content read back in a specific order. 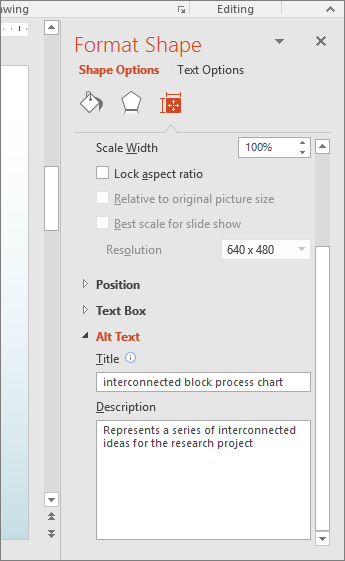 That’s why it’s a good practice to use the slide layouts in PowerPoint Online, which ensure that content is read in a logical order by screen readers. To ensure that tables don't contain split cells, merged cells, or nested tables use the Accessibility Checker. Note: The Accessibility Checker inspects your presentation for all issues that can be fixed in the browser. For a complete inspection, open your presentation in the desktop app and use the desktop Accessibility Checker for Windows or Mac. 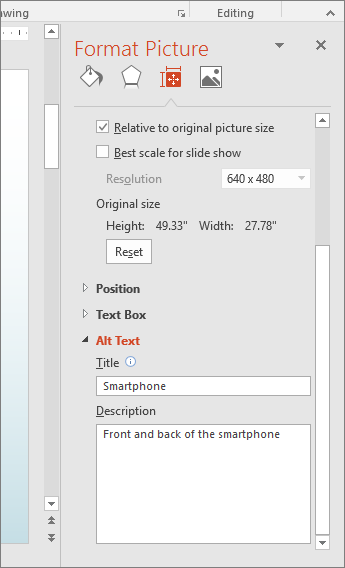 The following procedures describe how to add alt text to images and tables in your PowerPoint Online presentations. Select Alt Text, and then type a description for the image. Select Design > Alt Text. Type a description for the SmartArt graphic. Select a shape or video. Select Format > Alt Text. Type a description for the shape or video. Place the cursor in a cell of the table. Select Layout > Alt Text. 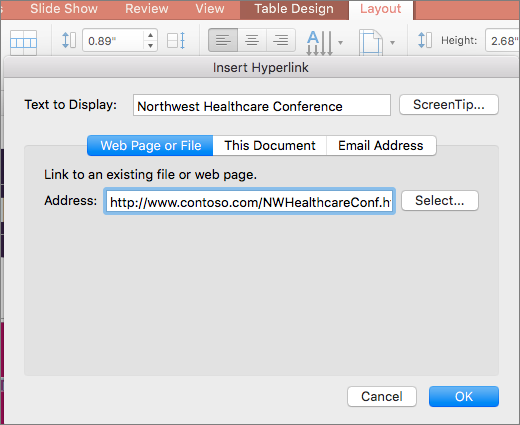 The following procedures describe how to make the hyperlinks and tables in your PowerPoint Online presentations accessible. Select the text to which you want to add the hyperlink, right-click, and select Link. The text you selected displays in the Display text box. This is the hyperlink text. In the Address box, type or paste the destination URL. 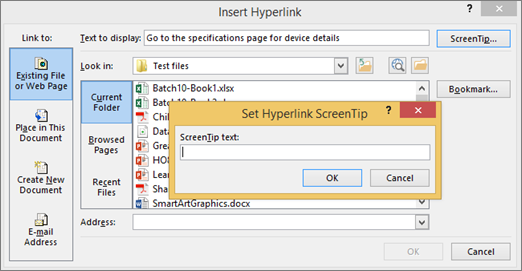 Select the text of the hyperlink, right-click, and select Edit Link. In the Display text box, edit the text you want to appear for the hyperlink. On Table Tools tab, select Design. Select Header Row, and then type the column headings in the table. The following procedures describe how to make the slides in your PowerPoint Online presentations accessible. Use one of the included accessible themes and templates to make sure that your slide design, colors, contrast, and fonts are accessible for all audiences. They are also designed so that screen readers can more easily read the slide content. 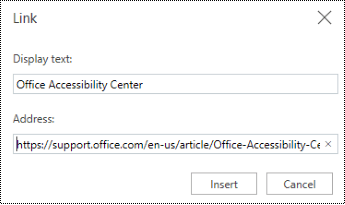 In your browser, go to Office.com, sign in to your account, and open PowerPoint Online. 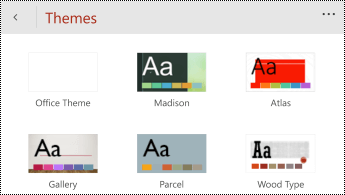 On the Welcome to PowerPoint page, select More themes. On the Select a theme page, scroll down to the bottom of the page, and select Explore all themes. 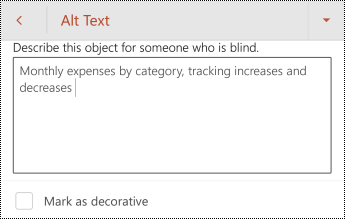 In the Search Office templates text box, type "accessible templates," and press Enter. In the template preview window, select Edit in browser. If your slides contain objects that aren’t part of a slide template, you need to arrange them in a logical order. Objects are read in the order you added them to a slide, which might not make sense when using a screen reader. 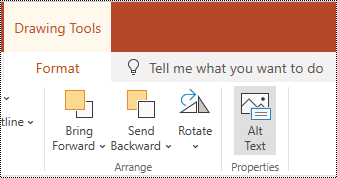 It’s easier to test the reading order in the PowerPoint desktop version because you can rearrange the order of objects in the Selection pane. 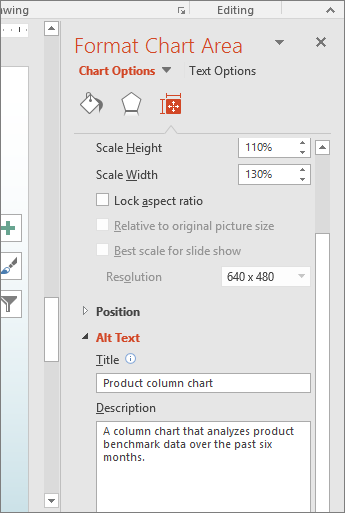 In PowerPoint Online, you can cut and paste objects to change their order on a slide. To test the order of objects on a slide, select the object, and then press the Tab key to switch the focus from object to object. In the Font group, select your formatting options. Select a slide without a title. On the Home tab, select Layout. 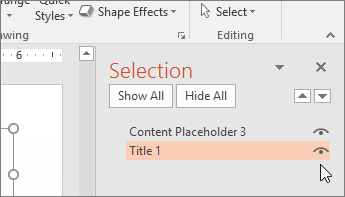 In the Slide Layout dialog, select a slide layout that includes title placeholders, and then select Change Layout. The new layout is applied to the slides. In the title placeholder, type a unique name. Note: A title doesn’t necessarily have to be visible to be accessible. For example, people who use screen readers hear a slide’s title even if it isn’t visible. 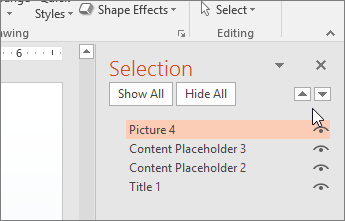 In the PowerPoint desktop version, you can use the Selection pane to turn visibility on or off for titles and other objects on a slide.